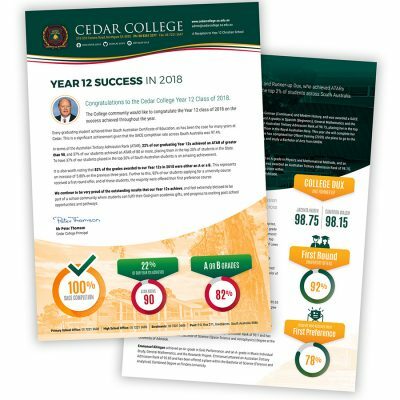 Congratulations to the Cedar College Year 12 Class of 2018. The College community would like to congratulate the Year 12 class of 2018 on the success achieved throughout the year. Every graduating student achieved their South Australian Certificate of Education, as has been the case for many years at Cedar. This is a significant achievement given that the SACE completion rate across South Australia was 97.4%. In terms of the Australian Tertiary Admission Rank (ATAR), 22% of our graduating Year 12s achieved an ATAR of greater than 90, and 37% of our students achieved an ATAR of 80 or more, placing them in the top 20% of students in the State. To have 37% of our students placed in the top 20% of South Australian students is an amazing achievement. It is also worth noting that 82% of the grades awarded to our Year 12s in 2018 were either an A or a B. This represents an increase of 5.80% on the previous three years. Further to this, 92% of our students applying for a university course received a first-round offer, and of these students, the majority were offered their first preference course. We continue to be very proud of the outstanding results that our Year 12s achieve, and feel extremely blessed to be part of a school community where students can fulfil their God-given academic gifts, and progress to exciting post school opportunities and pathways.